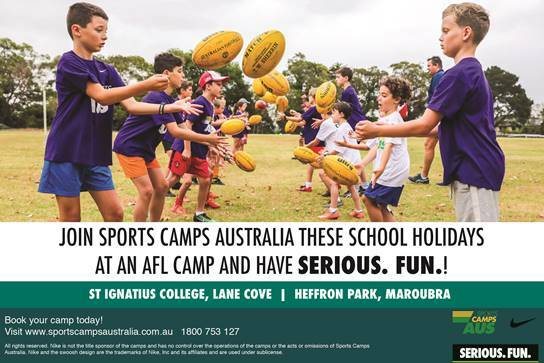 Some of you may have heard from Michelle Nikiforos from Sports Camps Australia and shared this information already. For those who know me and have helped promote these camps thank you for your ongoing support, I have only heard great feedback from campers and their families. To introduce myself to others I have not met, I have been involved in coaching for over 20 years following my brief football career playing with Richmond and Sydney Swans, more recently as long standing coach at Willoughby Wildcats, St Ignatius college and for the 3rd year as Camp Director and head coach of Sports Camps Australia AFL Camps. We provide great skills sessions and structured drills with lots of learning opportunities and I am supported by either Swans players, Swans Academy members or local U19/Premier division players to ensure there is experienced coaching and skills development for all ages and abilities. I would really appreciate if you could circulate this to all your players in the next week or so with your regular communications. If you are unable to share or for any reason would like to be excluded from this list, please reply. If there is a better contact at your club, please let me know. I am passionate about teaching both boys and girls the basics of footy. And having fun.